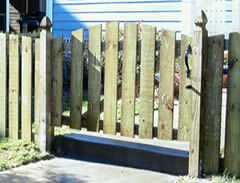 The yard is secure and separated from the sidewalk by this beautiful 4' wooden picket fence. 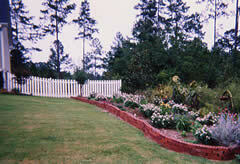 This 3' picket fence is painted white and provides a nice backdrop for the flower garden. 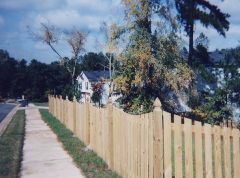 This 4' wood picket fence provides an attractive separation between the backyard and the driveway area. 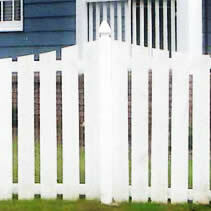 This convex picket fence with french gothic posts is excellent for pets. It allows your pets to see out while displaying beauty. 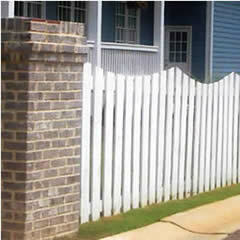 Picket fence looks great between columns. This is a nice and clean look. Be different! Paint your fence and allow it to be a part of your home.